Nottinghamshire director of cricket Mick Newell has spoken of his disappointment at Brett Hutton’s decision to turn down the offer a new contract at Trent Bridge to join Northants. Newell says he and the club hold academy product Hutton in ‘high regard’ and that he had a future with Notts, who last week pipped Northants to promotion to division one of the Specsavers County Championship by just five points. The 24-year-old, who has signed a three-year deal at the County Ground, told Newell of his intentions to leave for a new club as early as May, as he was keen to play somewhere he could be involved in white ball cricket, something he has been starved of at Notts. Although a key part of Notts’ red-ball team, with Hutton ending up their leading wicket-taker in this summer’s promotion campaign, he was constantly overlooked for both 50 over and T20 matches, playing just nine List A games and one T20 game in his six years on the playing staff at Trent Bridge. Notts have a star-studded limited overs line-up, and in 2017 won both the Royal London One Day Cup Final at Lords, and the NatWest T20 Blast at Edgbaston. Doncaster-born Hutton is likely to be heavily involved in all formats of the game at Northants, who have a much smaller squad than Notts, and Newell ‘respects’ the player’s decision to move on. 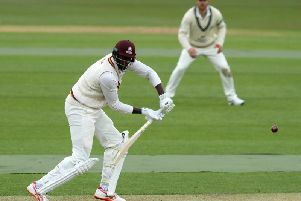 “We are disappointed to see a talented player who has come through our Academy ranks, and who we hold in high regard, leaving us, especially after he finished the season so strongly,” Newell told trentbridge.co.uk. “We made it known to Brett in the early stages of the season that we wanted him to stay at Trent Bridge. “But he informed us of his decision to explore his options in May, expressing his desire to leave because he wants to be a regular in all forms of cricket, something we haven’t been able to guarantee in the process of winning two white ball trophies this summer. “Brett believes that moving to Northamptonshire will give him a better chance to play in all formats, and, while we felt he had a bright future with us, we respect that decision. “He has conducted himself in a thoroughly professional manner this summer, even when he informed us that he was going to leave.